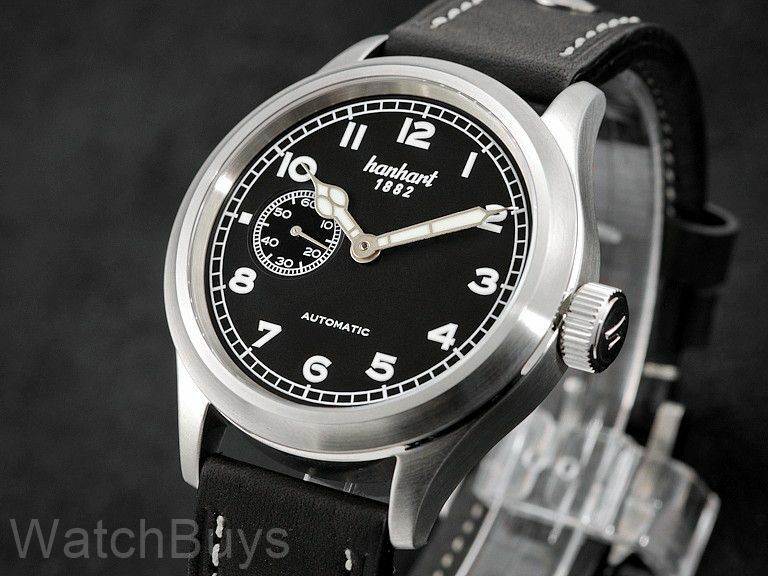 The Hanhart Pioneer Preventor 9 is the only Hanhart watch currently in the collection that does not feature a chronograph function. This watch features a distinctive small seconds display at 9 and incorporates the design elements of the Hanhart Pioneer Series paying homage to the first Hanhart wristwatches. This watch features a movement with specialized modifications by Dubois Dépraz to incorporate the sweep seconds hand at the 9 position. This placement has been made for historical reasons - the original Hanhart Calibre 41 also featured this layout. We love the overall simplicity and legibility of the design, and the matte black dial color adds to the original Hanhart look. This watch is fitted with a vintage black riveted calf skin strap with tang buckle. Verified Owner Comments: I was looking for a time only watch for daily wear with a steel case back that had the classic pilot look but also a contemporay elegance for more formal occasions. The Pioneer Preventor 9 checked all the boxes so I ordered one. I have had it for a couple of weeks now and here goes The photos do not do it justice In person it is even better looking (quite a beautiful piece ), great build quality and attention to detail. In my opinion hard to beat at this price point. I'm being picky here but if I had one complaint it would be the thickness. 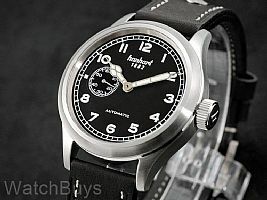 Personally in think 11mm instead of 12 would make this watch perfect! Verified Owner Comments: I was looking for an accurate but rugged watch for work. This watch has worked out great. It has an easy to read dial with an off center complication [seconds] that easy to read day or night. I am very impressed with Hanhart's attention to detail and craftsmanship. Buying from WatchBuys was excellent, watch arrived on time and was packed very well.